For the Frankish ruler of Aragon, see Aureolus of Aragon. Aureolus from "Promptuarii Iconum Insigniorum "
Aureolus (died 268) was a Roman military commander and would-be usurper. He was one of the so-called Thirty Tyrants who populated the reign of the Emperor Gallienus. Of humble Daco-Roman origins, he was 'made' by the Emperor Gallienus and proved himself to be one of the most brilliant and innovative soldiers of the age. However, he later turned against his benefactor, and was destroyed in the political turmoil that surrounded the Emperor's assassination in a conspiracy orchestrated by his senior officers. The ancient sources which refer to Aureolus are limited and the information they do provide is often contradictory. They include the Historia Augusta, Zonaras' epitome and Zosimus' Historia Nova. His career was most recently summarised in John Bray's biography of Gallienus. The analysis of Aureolus's career given here, especially his final rebellion, is largely based on Bray. There is no way of determining his date of birth, but given that he was at the height of his powers in the later 250s and 260s AD he is likely to have been born by 230 at the latest. Zonaras says that he was a herdsman born in the Roman province of Dacia, north of the Danube. It may be conjectured that, like many Dacians, he enlisted in the Roman Army as a young man and had the good fortune to come to the attention of the Emperor Gallienus. His first job was said to have been as a groom. If so, he must have been a good one, because we first encounter him as Master of the Imperial Horses ('Phronistes') according to Zonaras. The exact meaning of this term is yet unclear. Does it mean that he was Gallienus's Head Groom or does it refer to his later position as commander of Gallienus's cavalry army? (see below). He was said to have been ambidextrous which is doubtless a useful skill for a groom, but may also be a commentary on his untrustworthy character as interpreted by later historians. Throughout his reign Gallienus was always willing to promote talent wherever he found it, and Aureolus was one of the most brilliant of the New Men who were replacing senators in positions of high command in the army in the course of his reign. As Imperial Horsemaster Aureolus would have been well-placed to work with Gallienus in formulating and developing the concept of a self-contained cavalry force to beef up the effectiveness of the comitatus as a highly mobile field army under the Emperor's direct control. 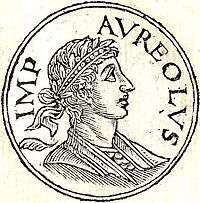 Aureolus was the first commander of this force under the Emperor. It was based at Mediolanum (Milan). Aureolus first made his mark in history in 258 (or 260 - the date is uncertain) when his cavalry was principally responsible for the defeat of the usurper Ingenuus at the Battle of Mursa (Osijek in Croatia). In 261 he commanded the force which defeated the army of the usurpers Macrianus Major and Macrianus Minor in battle somewhere in the central Balkans. As the army of the Macriani, which was swollen by the garrisons of the Danubian provinces that were obviously still seething with the resentments that had caused them to support first Ingenuus and then Regalianus, was probably at least 30,000 strong it would have required more than Aureolus's cavalry alone to challenge it. In any case Gallienus seems to have given Aureolus a free hand in crushing the rebels and entrusted him with a force that proved sufficient for the purpose. As to why Aureolus is credited with suppressing the Macriani as a major challenge to Gallienus's rule rather than the Emperor himself there are two possible explanations: (1) The determination of the Latin historians to denigrate the achievements of Gallienus; however, a more likely explanation is that (2) Gallienus was attempting at this time to crush the Gallic usurper Postumus who he probably saw as an even greater threat to his regime than the Macriani and to clear the Juthungi out of the Alpine province of Raetia where they posed a direct threat to Italy and Rome. (In any case, Postumus had been principally responsible for the murder of Gallienus's son, the Caesar Saloninus, which made their dispute highly personal in a way that with the Macriani was not). After the Macriani were defeated and the Danubian garrison forces who had supported them were pacified, Aureolus accompanied the Emperor in (another?) attempt to crush Postumus and his Gallic Empire. It may have been as a result of this campaign that the province of Raetia was recovered from the Gallic Empire (which had driven out the Juthungi where Gallienus seems to have failed) and Postumus's inscription on the Augsburg Altar was erased. However, Postumus managed to evade complete defeat thanks, it was asserted, to the 'carelessness' of Aureolus. It is often implied that even at this stage Aureolus was willing to see Gallienus displaced as Emperor and that he deliberately allowed the Gallic usurper to evade destruction. Zosimus (1.41) reports that Aureolus and two other officers conspired against Gallienus, but that all of them were punished and submitted, except Aureolus, who retained his anger against the emperor. It is now impossible to determine what lies behind this reference. Perhaps, as a Dacian, Aureolus resented Gallienus's policy of withdrawing elements of the Dacian garrison to reinforce his field army for the defence of Italy thus compounding the problems of barbarian incursions into Dacia. Such resentment may well have enabled Aureolus to persuade himself that Gallienus had forfeited his heaven-sent mandate to rule. However, this is pure speculation unsupported by any direct evidence as to what motivated Aureolus. At any event, whether or not he indulged in an unsuccessful conspiracy, Aureolus does seem to have lost the confidence of Gallienus as a result of his failure to destroy Postumus in Gaul even though he was not brought to trial nor dismissed from the Imperial service for that dereliction of duty. He had been given sole responsibility for the campaign against the Macriani, yet when the Goths and Heruls invaded the Danubian provinces with an enormous force in 268, Aureolus was not even a senior officer of the Imperial comitatus that accompanied the Emperor against the marauders. He was not even left in Milan to mind the shop against Postumus. He seems instead to have been made commander of the Raetian garrison while his cavalry went east with the Emperor under the command of Claudius (later the Emperor Claudius Gothicus) or Aurelian who also became Emperor in due course. Losing command of the elite cavalry he had done so much to create and had once led so brilliantly must have seemed a humiliating demotion for Aureolus. That it distinguished itself still further in the campaign against the Goths (especially at the battle of Nessus (the River Nestus that divided the provinces of Macedonia and Thrace) was no doubt additionally galling. (Post hoc ergo propter hoc (?) Aureolus confirmed his disaffection from Gallienus by deserting his Alpine command, and invading Italy where he took his old base, Milan. This was an act of the very highest treason and meant that Gallienus had to break off his campaign against the Goths in the Balkans at a most critical moment to return to Italy to deal with him. However, it may be that the long-term consequences of Aureolus's rebellion were even more serious in that it opened Raetia to further invasion by the Alamanni who then went on to raid in force into Italy itself next year in the early months of the reign of Claudius Gothicus. It may have been at this time that the Agri Decumates, the Roman lands north-east of the upper Rhine were lost for good. From Milan Aureolus invited Postumus to challenge Gallienus for the Empire with his support. Using the Imperial mint in Milan he had coins struck bearing Postumus's image as Emperor with appeals to the faith of his former comrades of the cavalry on the reverse. This seems to have been Aureolus's idea alone for Postumus never tried to suborn the loyalty of the cavalry in this way. In any event, Postumus ignored his invitation and Aureolus, unsupported by the Gallic usurper, was defeated by Gallienus in a battle on the River Adda east of Milan at a place known for centuries as Pontirolo (from Latin Pons Aureoli i.e. 'The Bridge of Aureolus'). He was then besieged in Milan which was invested by Gallienus's military comitatus (including, it would seem, the cavalry which Aureolus had been largely instrumental in creating and to loyalty of which he now appealed in vain). It cannot be certain what Aureolus's motives were in staging his desperate coup against Gallienus. It may have been sheer resentment at his demotion after the unsuccessful attack on Postumus combined with a belief that Gallienus's military policies had undermined the defences of Dacia and the Illyrian provinces. Admittedly, if indeed he had deliberately let Postumus off the hook, he would have been very lucky to escape with his life under almost any other Roman Emperor rather than be rewarded with another significant command. Military ambition quite often exceeded gratitude in Gallienus's reign. However, the conspiracy by the Praetorian Prefect, together with Aurelius Heraclianus, Claudius and Aurelian that was to cost Gallienus his life suggests that there was a growing belief at the highest level of the army in the later 260s that the Emperor was no longer fit to rule and Aureolus may well have shared these sentiments. When Gallienus was murdered it is possible Aureolus made his own bid for the Purple if a rather obscure issue of coinage is to be believed. However, as Aureolus had earlier offered his allegiance to Postumus it seems likely that he made this last defiant gesture - if indeed he did make it - only when Postumus failed to take advantage of the turmoil in Italy. Aureolus's end came when he surrendered to Claudius Gothicus who had by this time succeeded Gallienus as Emperor after the latter was assassinated in a 'Marshals' Plot' in which Claudius was almost certainly a prime mover. However, apparently before Claudius could decide what to do with him, Aureolus was murdered by Claudius's Praetorian Guard, supposedly in revenge for Aureolus's rebellion against Gallienus which had evoked great fury in the ranks of the Imperial comitatus which obviously did not share the treasonable disloyalty to that Emperor's regime of its most senior officers. The question might be asked, if they were thus infuriated by Aureolus who had merely rebelled against Gallienus - something a good many self-respecting senior soldiers had attempted during his turbulent reign - why did they not exact similar vengeance on his actual murderers? It could well be that the moral authority over the army exercised by Claudius, Heraclianus, Aurelian et al. who, however tainted by treason, had at least shown themselves as resolute defenders of the Empire in numerous wars against its barbaric foes, was of a different order to that enjoyed by Aureolus after his suspicious failure to finish off Postumus after his victory over the Macriani. However, it is also possible to suggest that the action of Claudius's Praetorians in taking it upon themselves to dispose of Aureolus would have been very convenient if their master wanted to obliterate any evidence of treasonable links between Aureolus and Gallienus's murderers. Against this one might wonder why Gallienus's treacherous marshals would see any benefit in associating themselves with damaged goods such as Aureolus. Sometimes the simplest explanations are most persuasive. Aureolus was murdered by furious soldiers who were then persuaded to turn a blind eye to the likely greater culpability of their new leader - no doubt convinced in the end by the generous donative he was able to offer them. In the end we do not know and will never know what motivated the men of the Imperial Comitatus or their leaders in 268 AD. ↑ ed. L. Dindorf (1870). Zonaras, 'Epitome Historiarum'. Leipzig: Teubner. ↑ ed. Mendelssohn, Trans. J. Buchanan and H.T. Davis (1967). Zozimus, 'Historia Nova'. San Antonio, Texas: Trinity University Press. ↑ Bray, John (1997). Gallienus: A study in reformist and sexual politics. Adelaide: Wakefield Press. ↑ Zonaras, Op. Cit. xii, 24. ↑ RJB (2003). "Gallic Consuls". Forum Ancient Coins.